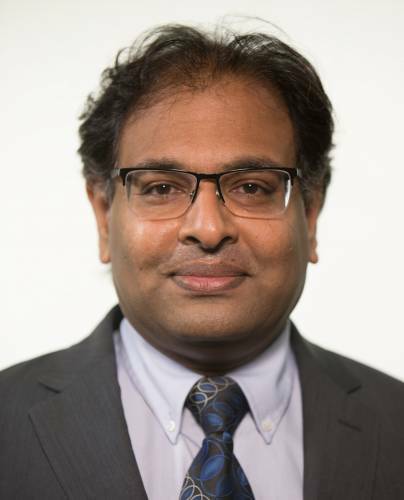 Shibu Jose serves as the interim associate dean in the office of research and extension in CAFNR and as the interim director of the Agricultural Experiment Station, effective January 1, 2019. He was the director of the School of Natural Resources at the University of Missouri. He also serves as superintendent of the Horticulture and Agroforestry Research Center. Prior to his current appointment he was the H.E. Garrett Endowed Chair Professor and director of the Center for Agroforestry at the University of Missouri (2009-2017) and Professor of Forest Ecology at the School of Forest Resources and Conservation at the University of Florida (1998-2009). Jose received his bachelor’s degree from Kerala Agricultural University, India, and his master’s degree and doctorate degree from the College of Agriculture at Purdue University. He has received nearly $46 million in funding ($13 million as PI) and has published eight edited books and nearly 200 research articles with over 6,000 citations. He has led major interdisciplinary research projects involving agronomists, plant breeders, soil scientists, animal scientists, natural resource scientists and socio-economists. He has published in such journals as Agronomy Journal, Plant and Soil, Frontiers in Plant Sciences, Applied Soil Ecology, Agroforestry Systems, Forest Science, Journal of Agricultural and Applied Economics and Nature among others. His economic development activities have led to several invention disclosures, two patents (pending) and one start-up company. He has served as the major professor for 14 PhD, 36 MS students, 11 postdoctoral scientists and 21 visiting scholars during his career. He has received numerous awards for research, including the highest honor for forest biology research (Barrington Moore Memorial Award) from the Society of American Foresters and the Scientific Achievement Award from the International Union of Forest Research Organizations (IUFRO). He recently received the inaugural (2018) Partner in Leadership Advancement Award from the University of Missouri and the Distinguished Alumni Award from the College of Agriculture, Purdue University. He serves as Editor-In-Chief of Agroforestry Systems, the premier journal in the field of agroforestry, published by Springer-Nature, and on the editorial board of several other journals. He is the chair of the Forestry Research Advisory Council that advises the U.S. Secretary of Agriculture. Dollinger J. * and Jose, S. 2018. Agroforestry for soil health. Agroforestry Systems 92:213-219. Weerasekara, C.S. *, Kitchen N.R., Jose, S., Motavalli, P., Bardhan, S., and Mitchell, R.B. 2018. Biomass yield of warm-season grasses affected by nitrogen and harvest management. Agronomy Journal 110:890-899. Donoghue, D.J., Mays, A.R., Hale, M., O’gorman, M., Gekara, O., Goodwin, H.L., Arsi, K., Spencer, T., Jose, S., Burke, J.M., Donoghue, A.M. 2014. Armed to Farm: Developing Training Programs For Military Veterans in Agriculture. Journal of Rural Social Sciences 29:82-93. Senaviratne, A. *, Udawatta, R., Nelson, K., K. Shannon, Jose, S. Temporal and spatial influence of perennial upland buffers on corn and soybean yields. Agronomy Journal 104:1356-1362.